The 2019 XC60 makes parking easier with its wide-view rear Park Assist camera. Now, drivers no longer need to leave their seats to get clear views of what lies directly behind their vehicles. It is also capable of superimposing lines on the screens to help drivers clearly visualize parking spaces. This system not only helps drivers to back into parking spaces more easily, but it can also improve overall safety levels. 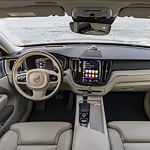 In addition to the park assist technology, the 2019 XC60 SUV deploys a special parking pilot for the front end of the vehicle. The parking pilot can help drivers to maneuver into tight parking spaces, thus preventing unnecessary and costly collisions. This system can take control of the steering wheel and perform both parallel and perpendicular parking maneuvers.